The 50mm focal length has always been one of my favorites. On a full frame or Super 35mm camera a 50mm lens will act as a beautiful “normal” length lens, closely resembling the field of view of the human eye, while on crop sensor cameras (such as Micro Four Thirds) they become excellent telephoto or portrait style lenses. Simply put, many 50mm lenses offer superb image quality, a fast aperture and a low price point. Certain focal lengths are more challenging to design and manufacture than others, which is why there are fewer lens choices when you get to the extreme wide angle or extreme telephoto side of the spectrum… And they are usually a whole lot more expensive too. Without getting into the science of how lenses are created, it’s safe to say that certain focal lengths (50mm and 85mm in particular) usually offer the highest performance to cost ratio. That’s why you might be able to find a 50mm lens for under $200 that outperforms a far more expensive lens in terms of sharpness, color accuracy and distortion, if the other lens happens to be a wide angle or telephoto. There are certainly exceptions to this rule, but for the most part 50mm lenses offer a tremendous amount of bang for your buck and are most definitely conducive to the cinematic look. As stated in the title of this article, the lenses on this list are intended to be budget-friendly. In other words, I am not including Zeiss Superspeeds, Cookes or any other very high-end cinema lenses as they are simply far too expensive for most filmmakers to afford. Instead, I want to share with you some 50mm lenses that will deliver results not too far off from much more expensive glass, but at a price point that is affordable to the indie filmmaker. As such, not all of these lenses are “cinema housed” – meaning that they don’t necessarily have a manual aperture, follow focus gears, or hard stops on the focus ring. However, they can be used in a filmmaking environment easily with the usual workarounds. 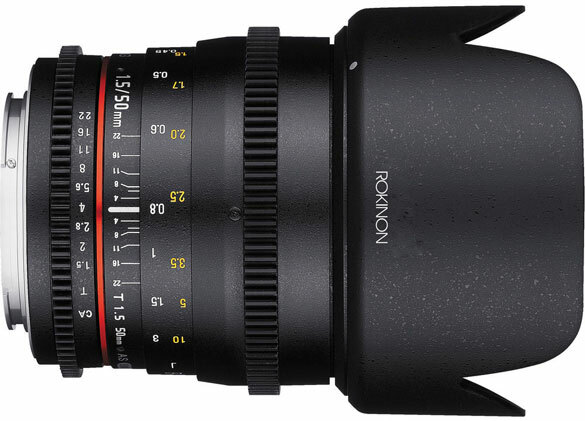 Why it made the list: This lens is truly a workhorse and offers a lot of value for your money. While it isn’t as cheap as the Canon 50mm f/1.8 lens or as fast as its bigger brother, the Canon f/1.2 L-Series lens, it is the ideal 50mm for filmmakers on a budget. It is an extremely sharp lens, the colors are beautiful and at f/1.4 it is very fast. While the L-series lens is slightly faster and has a bit of a better build quality, I wouldn’t recommend spending the extra money unless you are a more seasoned shooter and really need the extra speed. (Retails for $399). All of the lenses on this list are capable of delivering great results. Choosing between them largely comes down to what lenses you already own in your kit, your budget and what your needs are as a filmmaker. If you own a ton of Sigma or Canon glass, then complimenting your kit with a lens that will match well is always a good idea. But if you are starting completely from scratch, or are more of an eclectic lens buyer, the Zeiss or Rokinon might be best for you. Noam Kroll is an award-winning Los Angeles based filmmaker, and founder of the boutique production company Creative Rebellion. This article was originally published on his blog.